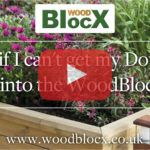 What if I can't get my Dowel to go into the WoodBlocX? Sometimes people can have a little bit of bother getting the Dowels to go in flush with the WoodBlocX. But if you use a little bit of soapy water, it can take away the extra friction stopping the Dowel going all the way in. Don't forget to also make sure you have the WoodBlocX up the right way (with the recess to the top) and also try to use a proper 2lb lump hammer. This can help a lot.